Following the completion of Marnie, Hitchcock began planning to fulfil his long-held desire to film an adaptation of J.M. Barrie's melancholic play "Mary Rose", which he saw when it premièred in London in April 1920. Marnie screenwriter Jay Presson Allen was hired to develop a draft screenplay and Albert Whitlock created a number of design sketches. Despite their strained relationship during the filming of Marnie, Hitchcock had intended Tippi Hedren to take the lead role of Mary Rose, and veteran actress Fay Compton — who was the original stage Mary Rose — was approached to play a minor role in the film. However, executives at Universal refused to green light the project and Hitchcock reluctantly put it to one side. According to biographer Patrick McGilligan, Hitchcock then began developing three separate project simultaneously — a crime caper in the style of Mario Monicelli's Big Deal on Madonna Street (1958) featuring a family of Italian crooks that was tentatively titled R.R.R.R., a crime drama inspired by the English murders Neville Heath and John Christie (elements of which would later resurface in the Kaleidoscope project) that would act as a kind of prequel to Shadow of a Doubt, and a gritty political spy thriller. It was this latter project, which Hitchcock dubbed a "realistic Bond", that Universal repeatedly encouraged the director to pursue and would eventually lead to Torn Curtain becoming his next film. In August 1964, Hitchcock renegotiated his contract with Universal — in return for the studio acquiring ownership of Shamley Productions and the distribution rights to Alfred Hitchcock Presents, The Alfred Hitchcock Hour and the five Paramount films that had reverted to the director, Hitchcock became the third largest shareholder in the studio. Although the new contract gave Hitchcock financial security and wealth, it essentially curtailed the enormous artistic freedoms he had enjoyed during his years at Paramount in the 1950s. Hitchcock's initial plans for his "realistic Bond" film centred around a scientist who defects to Russia and the impact this has on his wife. In November 1964, he wrote to Vladimir Nabokov in the hope the Russian émigré novelist could be persuaded to write an original screenplay. Hitchcock told Nabokov, "The question I'm really interested in is what would be the attitude of a young woman, perhaps in love with, or engaged to a scientist who could be a defector." Despite expressing interest in working with the director, Nabokov's busy schedule meant it would be the summer of 1965 before he could consider starting work. Next, Hitchcock approached Irish-born Canadian novelist and screenwriter Brian Moore, whose 1955 novel Judith Hearne the director greatly admired. Despite Moore's initial reluctance, he met with Hitchcock and eventually agreed to work on the screenplay when Universal doubled their pay offer to $50,000. By the end of March 1965, Moore had completed a five page synopsis that broadly mirrors the final film. A longer treatment was finished by the middle of May, and a complete first draft was submitted by on June 21st. He continued work over the summer and completed a third draft by the start of August. By now, Moore was exhausted and becoming disillusioned with the project — when Hitchcock requested further work on the script a few weeks later, the writer bluntly told him, "...if [this] were a book I were writing, I'd scrap it, or do a complete rewrite". Although Moore later realised his comments had offended Hitchcock and he wrote to say he would be happy to continue working on the script, the director had already hired the English writing team of Keith Waterhouse and Willis Hall, who arrived into Hollywood shortly before production commenced in November. Waterhouse later recalled, "We often found ourselves revising scenes only hours before they were to be shot [...] a messenger would be waiting to rush our latest rewrites across to the Torn Curtain sound stage, where they would be thrust into the hands of the actors even as Hitchcock lit them for the scene." 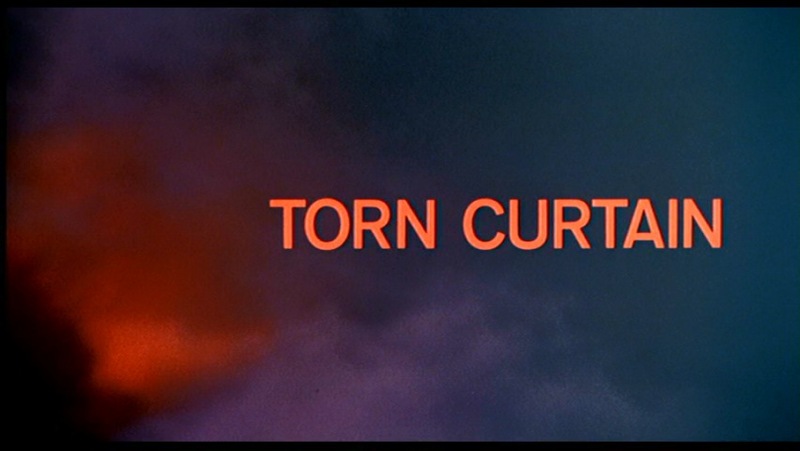 Universal executives were keen for Torn Curtain to be a return to Hitchcock's Paramount-era films, with big name stars and colourful locations. In the spring of 1965, Hitchcock met with Cary Grant but the actor was already committed to filming Walk, Don't Run in Tokyo and was planning to retire afterwards. Lew Wasserman lobbied hard for younger lead actors and the studio persuaded the director to select two of Hollywood's biggest stars, Paul Newman and Julie Andrews. Hitchcock apparently was unable to warm to either of the actors and privately griped to François Truffaut that their combined salary "of $1,500,000 is more than we have to pay for the cost of the rest of the picture." The director also struggled to decide whether to make the character of the defecting scientist or his wife the emotional core of the film and, in Brian Moore's words, Hitchcock felt "inhibited" by the casting. Due to the difficulties of filming in East Germany, a German second unit was hired to surreptitiously capture various locales and scenery that could then be edited into the film to add an air of authenticity. However, their footage proved to be substandard in quality and couldn't be used. Instead, Hitchcock resorted to using American locations to double as European ones: Berlin's Schönefeld Airport was replicated at a San Fernando Valley airport, exteriors of the East Berlin farm were filmed near Camarillo, Long Beach harbour stood in for the Swedish docks, and Karl Marx University was actually the University of Southern California. To tie in with the release of the film, an adaptation novel written by Richard Wormser — based on Moore's screenplay — was published by Dell. ↑ Namely, Rope (1948), Rear Window (1954), The Trouble with Harry (1955), The Man Who Knew Too Much (1956) and Vertigo (1958). In 1983, following Hitchcock's death, Universal acquired the full rights to the films for a reported figure of $6,000,000.